UN chief Antonio Guterres expressed deep concern Thursday over the risk of confrontation in Libya after forces loyal to a controversial strongman announced they were preparing to advance on Tripoli. "I am deeply concerned by the military movement taking place in Libya and the risk of confrontation," the visiting Guterres tweeted from the capital, which is controlled by a UN-backed unity government. "There is no military solution," he added. Dozens of militias have fought for control of the North African country since a NATO-backed uprising toppled longtime dictator Moamer Kadhafi in 2011. But the self-proclaimed Libyan National Army of Khalifa Haftar has emerged as a key player, opposing the government in Tripoli and backing a parallel administration in the east. 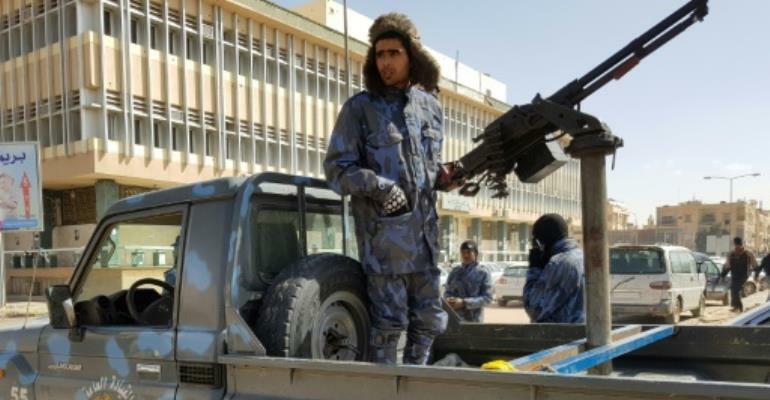 Haftar launched an offensive into oil-producing regions of southern Libya in January ostensibly aimed at wiping out "terrorists" and criminal groups. He has repeatedly expressed his intention to march on Tripoli. LNA spokesman Ahmed Mesmari said at a press conference on Wednesday that "preparations are on the point of being completed... to purge the west of terrorists and mercenaries". Unity government chief Fayez al-Sarraj called the move an "escalation" and urged Haftar's forces to "stop using the language of threats". He said he had ordered pro-government forces to prepare to "face all threats... whether from terrorist groups, criminals, outlaws and all who threaten the security of every Libyan city". The bellicose comments from Haftar's forces come as the United Nations prepares to convene a conference later this month to hammer out a roadmap for delayed parliamentary and presidential elections. "Only intra-Libyan dialogue can solve Libyan problems," Guterres said on Thursday. "I call for calm and restraint as I prepare to meet the Libyan leaders in the country." The rival leaders had agreed in Paris last year to hold elections before the end of the year, but that vote never materialised as Haftar's forces and the Tripoli government grappled for power. The UN has said Haftar and Sarraj agreed at a meeting in Abu Dhabi last month to make a new attempt to organise the elections.